The Infinity Sweater pattern PDF is now available on it’s own. I know you’ve been waiting patiently since the bundle sale. I received so many kind requests, that I thought it must be time to share my pattern with you. You can whip up a couple to give as gifts once you realize how easy it is to make and wear! Get your hands on a copy and see how two yards of a drape-y knit fabric can become the most versatile piece in your wardrobe. The Infinity Sweater sizes XS – XL is now available. The Infinity Sweater is designed to be fashion-forward, but it still maintains a lot of classic appeal. There are about a zillion ways to wear it, but let’s cover just a few here to get you started. Let the sweater hang loose and its long, draped front pieces will fit right in with this season’s trends. Just grab your sweater and go to pull off this look – no extra styling required! For an equally easy look that shows off the curves of your shape, add a belt to your sweater for a fast look. Simply cross the sweater in front of your body and then fasten your favorite belt around your waist. This look is equally gorgeous with pants or a skirt, and you can change the styling just by changing the belt! Janna of Lilac Pop took the cover shot wearing the original red sweater, which she rocks with a pair of high-heeled boots and tights. Since the front panels are so long, you can twist them in endless ways! Try twisting them around each other a couple times, then pull the ends around to the back and tie like Janna did with the cream sweater. With a little practice you can style either version of this look the way you like it. For a fun look that covers your torso and shows off your shape, try crossing the wraps in the front and bringing them up over the opposite shoulders. Once there, let them hang down or tie them behind your back. This look is as easy as throwing a scarf over your shoulder and it’s a super way to style this top to make it look like an entirely new garment! The simplest way to drape this sweater is to tie the corners of the long ends together and throw the knot over your head to tuck behind your neck. You can also twist the fabric before you put the knot behind your head for an infinity scarf/cowl look. This is my favorite way to wear mine. One last look for today – the wrap! Simply cross one panel over your chest and wrap it tightly (or loosely, however you like it) around to your back and hold it in place. Then repeat that process with the other panel and tie the tips of the ends together or tuck into the top of your jeans, covering with the bottom edge of the sweater. Now you’ve got a wrap-style top! No matter how you twist it, the Infinity Sweater sure has style. And it’s available now – so what are you waiting for? Two yards of fabric and a couple hours until you could have your very own! We’d love to know – what’s your favorite way to wear this top? Have you tried a different twist on styling a sweater like this? Share with us in the comments below! Love it! Want it. Will keep an eye out for good knit for this. HAve any recommendations for where to get online? 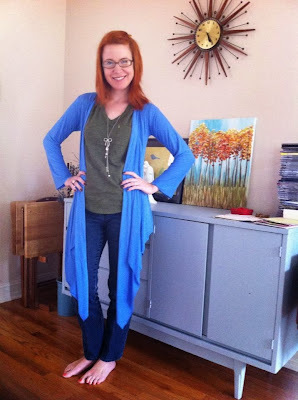 I love to wear sweaters like this with one side draped up over the shoulder, but the underneath one down. Enjoyed the weekend—thanks for all your help! I’m looking forward to sewing this pattern and would love to pattern test a wrap dress! Hi Jane – 2 yards!